MOSCOW, April 15. /TASS/. 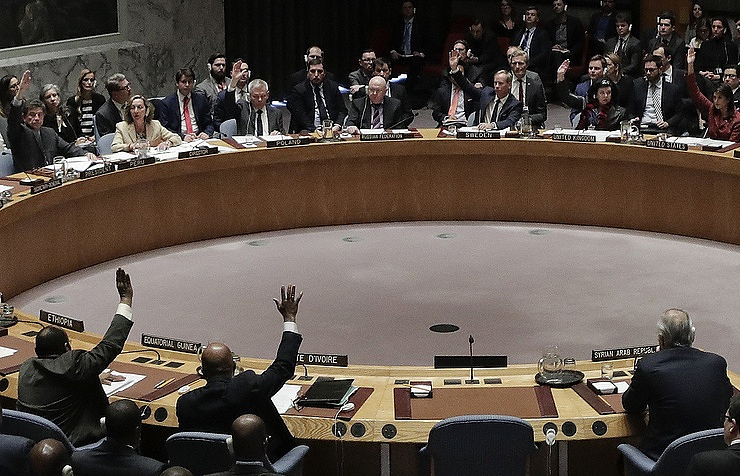 France, the US and the UK have circulated a joint draft resolution on Syria at the UN Security Council that denounces the use of chemical weapons there and demands the establishment of an independent mechanism for investigating such incidents, AFP reported on Saturday evening. The draft resolution resolutely denounces all cases of the use of chemical weapons in Syria, especially the attack in Douma on April 7, the agency reported citing the text of the document. It stipulates the establishment of an independent mechanism for investigating such incidents based on the principles of objectivity and professionalism. The draft resolution prepared by the French delegation calls on Syria’s authorities to cooperate with the Organization for the Prohibition of Chemical Weapons (OPCW). In addition, the document’s authors call for the establishment of a stable peace and free access for humanitarian help, as well as medical evacuations (of the population) if needed. The draft resolution calls for constructive participation of Syria’s government in intra-Syrian talks without preconditions, AFP reported. The document will be discussed on Monday, AFP’s sources in diplomatic circles said.